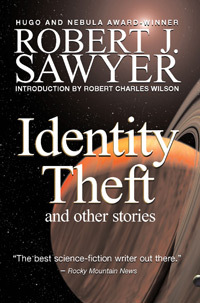 Over at SciFi Wire, the news service of the SciFi Channel, John Joseph Adams interviews Robert J. Sawyer about his new collection, Identity Theft and Other Stories. I'm glad you put notes in the book also. I enjoy reading about what inspired a story and what the writer was trying to accomplish or why the story is written in a specific way..etc, etc, etc. That book in next in my queue.